But his conversion to Islam didn’t have anything to do with the shooting, right? Because Islam is the religion of peace, right? A man believed to have taken part in the shooting that killed at least three police officers from Baton Rouge, LA, was from the Kansas City metro area. 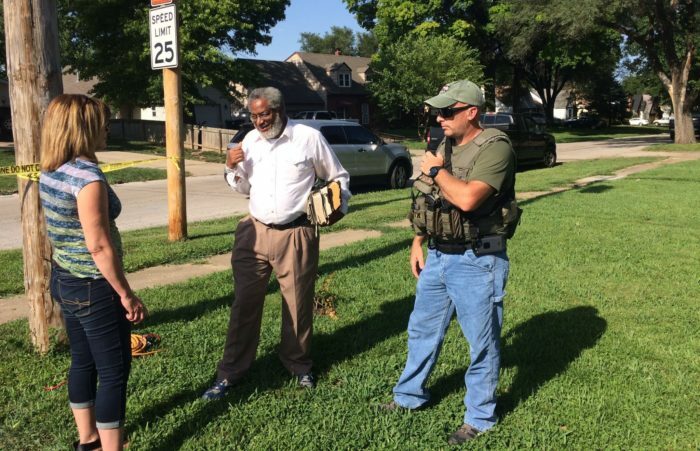 Sources tell KCTV5 the shooter is 29-year-old Gavin Eugene Long. Three police officers were killed and three additional police officers were wounded Sunday morning in Louisiana. On Sunday evening, police taped off a scene believed to be Long’s most recent home in the 1100 block of East 77th Terrace. At one point, police surrounding the home and said there was a man inside who pointed a gun at reporters. At that time, they treated the area as if there is an imminent threat to surrounding residents and businesses. Police had the street in front of the house blocked off for several hours before moving to a second location a few blocks away late Sunday night. Overnight, the investigation also led the FBI, Kansas City and Baton Rouge police to the Waldo Height Apartments at East 81st and Cambell streets. The apartment is about half a mile from the home. Long was a former Marine, according to CBS News. He graduated from Grandview High School in 2005. Grandview police say Long had no arrests on his record. He got a ticket in 2003 and failed a field interview in 2005. The University of Alabama confirms Long attended the university for a semester in 2012 and made the Dean’s List. The university says UAPD did not have any interaction with him as a student. Long was a sergeant, according to records. He served in the military from Aug. 22, 2005 until Aug. 21, 2010. He was awarded the Marine Corps Good Conduct medal, Iraq Campaign Medal, Sea Service Deployment Ribbon, Global War on Terrorism Service Medal, National Defense Service Medal and the Navy Unit Commendation Medal.